The second part of the Assurance Component of the Pan-Canadian Assurance Model to discuss are Transaction Assurance Levels, or more simply, Trust Levels. Trust Levels are defined in the pan-Canadian IdM&A Framework as ‘a pre-established statement of the level of certainty that is needed to access information or conduct a transaction.’ They are directly linked to the Information Classification. 1. No Trust — Anonymous Transaction. Used with information that is unclassified (e.g. published information). 2. Low Trust — Routine Transaction. Used for protection of systems containing basic information, i.e. information with a Security Classification of Low. 3. Medium Trust — Verified Transaction. Used with systems that need to protect confidential data, such as some medical records, tax information, identity information, etc. It is important to note that the ‘transaction’ referred to in this discussion is the business transaction that will be supported by the identity and access management system. For example, medium trust is needed by business transactions that needs to be verified (due to the sensitivity of the information being protected). Trust Levels allow for a clear description of what we need to establish before we allow access to an application or information set. 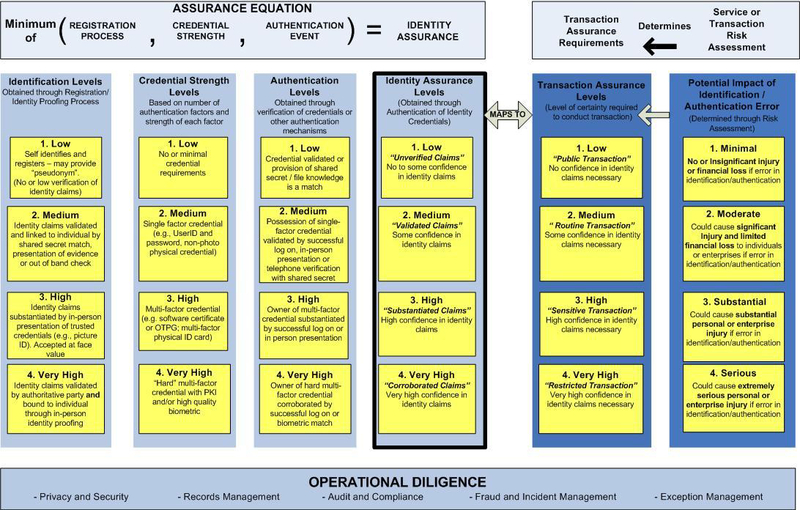 On the surface, the Trust Levels differ little from the Security Classifications, but the exercise in assessing trust and assigning a Trust Level is important. It forces the business to ask some key questions: How much do I need to do before allowing access to this information? Have I classified the information correctly and is it reflected the Trust Level? As can be seen from these questions, the word ‘trust’ forces the business to look at the Security Classifications in a somewhat different light. That allows for better conversations around what the value of the information is and what an appropriate access solution might look like. This entry was posted on Sunday, November 30th, 2008 at 2:54 pm and is filed under identity management, information security, pan-canadian, trust. You can follow any responses to this entry through the RSS 2.0 feed. You can leave a response, or trackback from your own site.